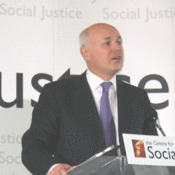 Iain Duncan Smith MP presents the conclusions of his social justice policy group later today. Here he sets out the 'big picture ideas' at the heart of the 'Breakthrough Britain' report. Three: Britain needs to combine two different understandings of how to fight poverty. The traditional laissez-faire approach understands poverty as a product of wrong choices - wrong choices about family, drugs, crime and schooling. That view says that poverty is always the fault of the person who makes the wrong choices. On the other side of the political divide the elimination of poverty is seen as the job of government. Government is blamed for poverty. The approach outlined in the Breakthrough Britain report is based on the belief that individual people must be responsible for their choices but that government has a big responsibility to help people make the right choices. Government should therefore support marriage and support initiatives that encourage debt-free and drug-free behaviours. ‘Shared responsibility’ is the name that David Cameron gives to the approach. The fourth idea is that the welfare society is usually better than the welfare state. The welfare state offers standardised care to everyone and it has an important role but it’s only in the welfare society that every person in need is an individual. They may be a child benefiting from the love of a parent. They may be a lonely, frightened pensioner who is visited every day by a concerned neighbour. They may be an addict who is being mentored by someone who has overcome drugs themselves. I know that the welfare society is alive and well in Britain today. Every year my Centre for Social Justice awards the best examples of effective poverty-fighters. I also know that these effective poverty-fighters are overloaded with bureaucracy and they would spend money much more effectively than most government-run welfare projects. They provide people in poverty with a second chance. The nation of the second chance is the nation I hope we will build. A nation that never gives up on any individual or any community. All across Gordon Brown’s Britain there are too many communities where hope has died. Our ideas on pioneer schools, drug rehabilitation and freedom for the charitable sector will start to change that. The road to social justice is a road that will require the leadership and determination of a whole generation but it will be worth the effort. I am delighted that Conservatives are now leading the way.